I converted from day hiking and car camping to backpacking in 2013. My backpacking trips are one or two weekend excursions per month in Southern California. The locations range from Joshua Tree National Park desert areas in the cooler months to mountainous elevations in the summer months. I always hike with a group and like the gear talk in camp. While I am looking for ways to lighten my pack, I am not an ultra-lighter: I like sleeping in a tent with a sleeping bag on a comfortable pad. In January 2017, I added snowshoeing to my winter activities. On the US website of this British manufacturer, I do not find the Down CARE Kit, only a Down WASH Kit. Yet I find the Down Care Kit on the British website www.grangers.co.uk at 15 British Pounds. The Grangers Down Care Kit is described as a 2-in-1 wash for all down articles, including down jackets and down sleeping bags. The care kit is designed to clean and revive insulation of down articles, and is intended to add durable repellancy. The Grangers Down Care Kit is packaged in a cardboard box 8.25 in tall x 4.75 in wide x 2.75 in deep (21 cm x 12 cm x 7 cm). The front side shows an image of the bottle and three balls, while the back side provides product details in English and French text. The cardboard box contains one plastic bottle at 8 in tall by 2 in diameter (20.3 cm x 5 cm). The bottle holds 10 fl oz (300 ml) of liquid. 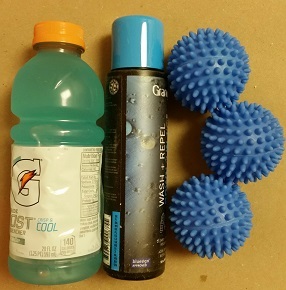 Each of the blue plastic balls is about 2.5 in (6.35 cm) diameter including its many 0.2 in (5 mm) projecting knobby spikes. I shall use two caps (3.4 fl oz/ 100 ml) per down jacket and 3 caps of liquid (5 fl oz/ 150 ml) for a down sleeping bag. For top loading or high capacity machines I shall double the dosage. This liquid is suited for soft, medium and hard water. Next I shall place the item in the washing machine and run the machine on slow spin at 86 F/ 30 C. If needed, I may run additional spin cycles. How do I know that additional cycles are needed? If the item's care label permits, I shall tumble dry on low for best results. While using a low/ medium setting, I shall periodically check and separate the down to avoid clumping. Placing the dryer balls into the drying machine is described to improve both the drying times and help restore the loft. Grangers mentions their You Tube for additional care tips. CAUTION: The liquid wash shall be kept out of reach of children. I shall avoid contact with my skin and my eyes and only use the product as directed. 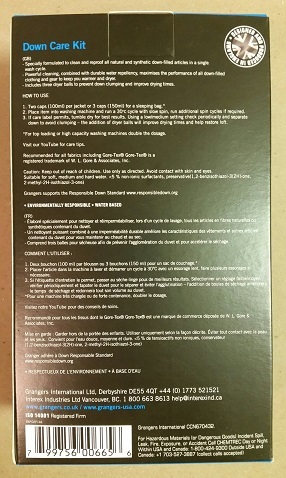 The box mentions these chemicals: less than 5% non-ionic surfactants, preservative (1,2-benzisothiazol-3(2H)one, 2-methyl-2H-isothiazol-3-one). The bottle I received has an Expiration Date of 2021. After I had removed the blue bottle cap for the first time, I next had to remove a silver seal from the bottle opening in order to do a liquid smell test. A strong odor similar to nail polish is noticeable. I sure hope this chemical odor does not transfer to my soft and cozy down jacket and fluffy, snuggly sleeping bag. The Grangers Down Care Kit is suitable for cleaning and waterproofing down items. The first item I washed with the Grangers Down Care Kit was my many years old down sleeping bag. Following the bag's washing instructions, I closed the zipper. I used a front loading high efficiency washing machine. This machine does not show temperature settings (no indication of degrees). After researching the various available settings, such as Colors, Permanent Press, Woolens, I finally settled on the Delicates & Knits setting. This setting is described as avoiding damaging and stretching of certain fabrics, as well as having less agitation. On this washing machine, I can choose the basic wash cycle (usually around 36 minutes full duration) or add a super cycle. I selected the additional super cycle which resulted in 44 minutes total duration. 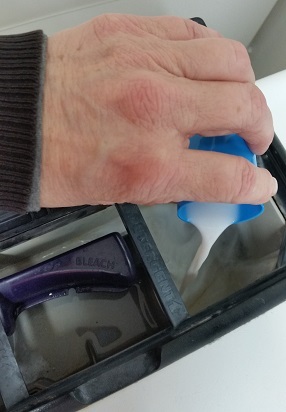 I poured 3 caps of the white-colored, thin Grangers Down Care liquid into the washing machine. I spaced out those three caps to make sure quite some water was gushing into the machine between cups. My theory is this method distributes the cleaning liquid a bit more throughout the machine. 45 minutes later, I pulled the sleeping bag out of the washing machine and was positively surprised that it was not soaking wet but more like evenly damp or moist. The bag seemed evenly feather-filled: I did not notice a heavy clump of feathers in select areas. Next I placed my closed sleeping bag into the dryer along with the three dryer balls. The dryer offers three settings: Whites & Colors, Permanent Press or Delicates. I selected Delicates at 20 minutes. There was quite some clanking of the balls in the dryer. 20 minutes later, the sleeping bag still felt quite damp, specifically in the footbox area. I turned the entire bag inside out, again added the dryer balls and set Delicates for another 20 minutes. After the second 20-min dryer cycle, the sleeping bag still was not dry. I fluffed it up generously, kept it inside-out and set the dryer at Delicates for another 20 minutes. Still not dry, I ran a fourth and final dryer cycle at Delicates. This final run, I turned the sleeping bag right-side out and along with those three dryer balls let it all tumble another 20 minutes. When I finally got the bag out, I noticed just three feathers in the metal dryer mesh but no fabric fibers. The sleeping bag still had minor sections that were not fully dry but I had no more time available for additional dryer runs. I fully opened the zipper, shook out and fluffed up the bag extensively and placed it on a drying rack for the next 36 hours. Afterwards it was all dry for sure. The next wash with the Grangers Down Care Kit was my EMS WOMEN'S HOODED DOWN JACKET (reviewed elsewhere on backpackgeartest.org). Since the down jacket looked rather lonely inside the big front loading washing machine, I added the shell of my waterproof HIGH SIERRA ALTA INTERCHANGE JACKET (reviewed elsewhere on backpackgeartest.org). The 100% Taslon nylon shell has a 100% Taffeta polyester liner and a polyester filling, so it definitely is not down. But the shell needed a wash and since the Grangers Down Care liquid also adds durable repellency, I was hoping it would help refresh the jacket's repellency. 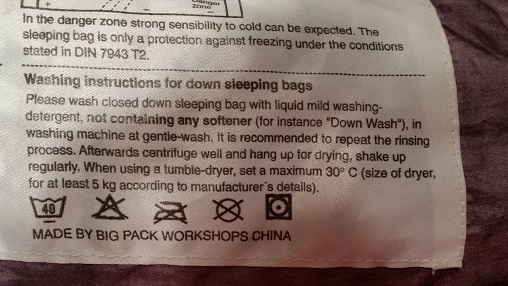 Grangers washing instructions say to use two caps of liquid per jacket. Seeing that I washed two jackets in one go, I used the rest of the liquid that was inside the bottle: I measured 3.5 caps - then all liquid was gone. 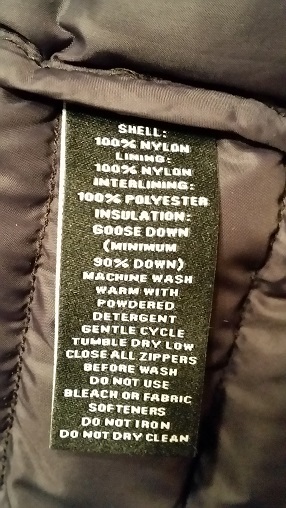 I closed the zippers of both jackets, as their washing instructions require. I pressed Delicates & Knits, added the Super Cycle and the machine indicated 44 minutes of total washing time. 45 minutes later I pulled a soggy, dripping wet High Sierra jacket polyester shell out of the washing machine. And the EMS Hooded Down Jacket was also really wet: a heavy bundle of moisture, considerably more wet than the sleeping bag had been. 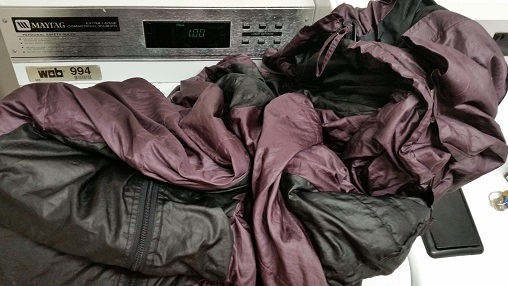 Alright, I put just the EMS Hooded Down Jacket into the dryer on the Delicates setting for initial 20 minutes. The three dryer balls generated quite some tumbling noise, since there was only the one down jacket in the large dryer. The High Sierra jacket shall not get placed into a dryer, so I hung that polyester shell to line dry. 20 Minutes later the down jacket was almost dry. The down jacket had so much room to tumble in that big dryer that it dried much faster than the big, large sized sleeping bag that had little room to tumble freely. I turned the down jacket inside out and placed it inside the dryer again for a second 20-minute run on the Delicates setting. Afterwards, I felt the down jacket was dry enough, so I did not put it in for a third run. Instead I opened the zipper, fluffed the jacket to evenly distribute and to loosen the feathers, then hung it to fully air dry for 36 hours. Even though the Grangers Down Care liquid has a strong smell like nailpolish, neither my dry down sleeping bag nor the jacket smell like that at all. All washed items have a normal, neutral scent. I have to admit: I had been rather worried that a washing machine wash might ruin my super nice EMS Hooded Down Jacket and I had delayed giving it a good wash. 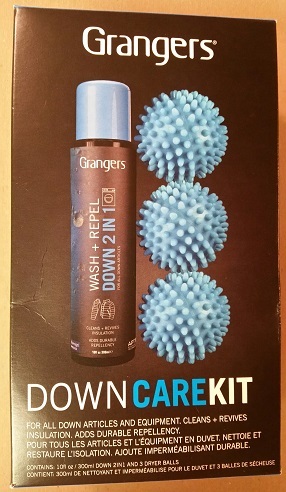 I am positively surprised by the good cleaning results following the Grangers Down Care Kit washes of both my sleeping bag and the down jacket. During the test period, I did not experience any rain or other chance for my down jacket or sleeping bag to get wet. 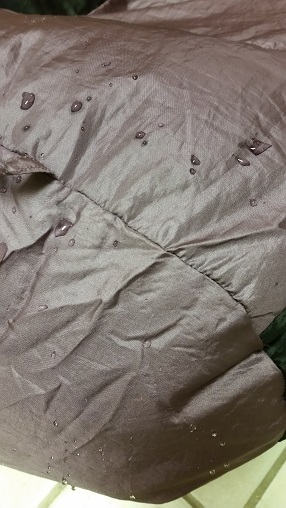 I dripped a few beads of water onto my sleeping bag and while some beads pearled off, any beads standing on the fabric started soaking in after a few seconds. Grangers Down Care is an easy-to-use care liquid for cleaning and waterproofing down products. The dryer balls did a fine job distributing the feathers and improving loft. I used up the entire 10 fl oz (300 ml) bottle contents for this test series. Next time I need to wash my down items, I will turn to Grangers Down Care again. Thank you to Granger's International Ltd and BackpackGearTest.org for the opportunity to test this down care kit and get my down items well-cleaned.